Cut ridge gourd into small pieces. Cook toor dal adding enough water till half done. Drain the water from it and keep it aside. Crush shallots, garlic and 3 dry red chillies together and keep it aside. Heat oil in a pan, splutter mustard seeds and add 2 dry red chillies and curry leaves. Add crushed ingredients (step 2) and turmeric powder and saute well for few minutes. Excellent dish, love with some rice. I like ridge gourd...I am always in search of such recipes...It is good to have ridge gourd in your diet if you are having 'Pitta' prakruti. like this healthy combo always..
Yummy and healthy thoran...nice combo. Thanks for stopping bye! Nice blog.... Happy to follow u.
Tasty n filling stir fry, looks inviting! 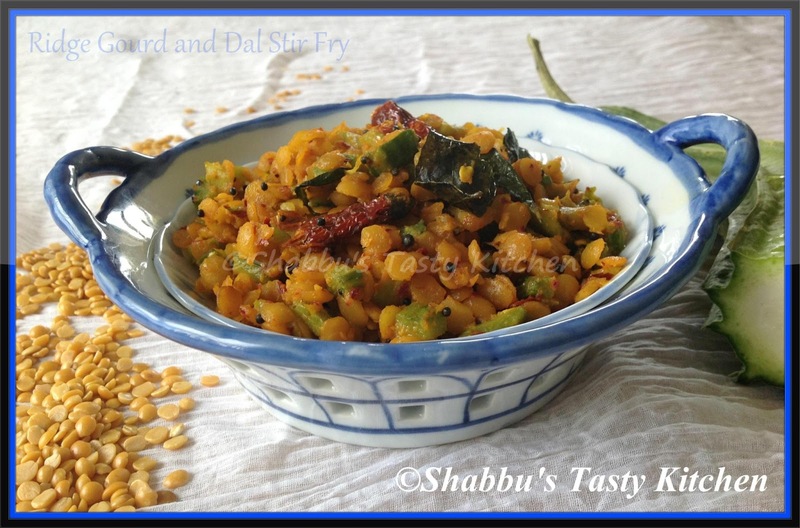 Can i use dal this way too-yum! I love such combos..Nice one Shabbu.